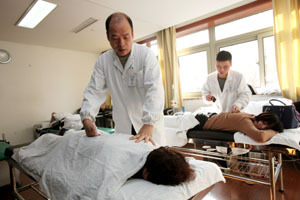 It is the earliest and leading massage department in China, over 30 kinds of diseases can be treated through massage, especially in treating cervical lumber pains, such as vertigo, headache caused by prolapsed inter-vertebra disc and cervical spondylosis etc. Other achievements made by the department include the therapy of 'Resolving Adherent Osteo-Arthritis', the treatment of dislocated small joints of lumbar vertebrae with the 'Pull-Rotate Plus Leg-Pulling' method, and the successful therapy of manipulation in treating pediatric diarrhea, malnutrition, convulsion, infantile paralysis, spinal spondylopathy, and muscle-related torticollis,Headache, epigastric Pain, hypertension, heart disease. Insomnia and Sequelae of Strokes are also treated in this department. The department is also undertaking Pediatrics massage for infantile diarrhea, infantile muscle-related torticollis, and other internal organs disorders. It is on the leading level in Zhejiang Province for treating cervical spondylosis, prolapsed lumber inter-vertebra discs. They have been treating over 5000 patients who with prolapsed lumber inter-vertebra discs by the technique of ONE-TIME bone setting and realignment. It has been awarded the first prize of Zhejiang Province medical science & technology advancement. Massage is not only a treatment for many kinds of disease, but also a traditional method for health care and rehabilitation. Dr. Ye Shuliang is the director of Tuina dept, Associate Chief Physician of Chinese Medicine, Associate Professor of Zhejiang Chinese Medical University, Vice Chairman Committee Member of Tuina Branch-Zhejiang Chinese Medicine Academy. Dr. Ye's specialty is using TCM bone setting manipulation to rebuild internal & external balance of spine, there for to treat cervical-genetic headache, dizziness, attention deficit hyper-activity disorder (ADHD), protrusion of lumbar inter-vertebral disc, scoliosis etc. Dr. Ye is in charging and participating in 7 national and provincial research projects. His clinical study of 'The Treatment for Spinal Mini-joints Dislocation-Related Diseases', has achieved remarkable outcomes. The research of 'Correlations Between Lumbago & Social Psychological Factors of Air Crewmen & Submarine Workers' had awarded Third Progressive Prize of Science and Technology of Chinese People's Liberation Army in 2010. Dr. Du Honggen is an Associate Chief Physician of Chinese Medicine, Master of Medicine, committee member of Tuina Branch-Zhejiang Chinese Medicine Academy, committee member of Acupotomy Branch-Zhejiang Acupuncture Academy. He has over 20 years clinical experience, specialized in diagnosing and treating cervical & lumbar spondylosis, headache, spinal joint dislocation by means of bone setting and re-aligns spinal joints, it achieved remarkable effectiveness, won widespread praises. He also has rich experience in treating hyperostosis, degenerative arthritis; It is Dr. Du initiates the TCM balance comprehensive therapy for treating adolescent scoliosis, helped many teenagers avoiding operation. Meantime, he also participates in several national and provincial research projects, over 10 essays have been published on national first class medical journals. Dr. Chen Weiren is a Chief Physician of Chinese Medicine; Professor of Zhejiang Chinese Medical University and committee member of Tuina Branch-Zhejiang Chinese Medicine Academy. He has over 40 years clinical experience in treating cervical spondylosis, scapulohumeral peri-arthritis, protrusion of lumbar inter-vertebral disc, degenerative arthritis, soft tissue injury, sports injury, body joints and mini-joints dislocation, unknown etiology lumbago and other difficult miscellaneous diseases, enjoys high reputation in Zhejiang province. Dr. Song Hongquan is a Chief Physician of Chinese Medicine, Associate Professor of Zhejiang Chinese Medical University, Tutor of Master Students, committee member of Tuina Branch-China Tuina Academy. Dr. Song has over 30 years clinical experience in treating cervical spondylosis, scapulohumeral periarthritis, protrusion of lumbar inter-vertebral disc, degenerative arthritis, soft tissue injury, sports injury, joints and mini-joints dislocation. He also has rich experience in teaching and scientific research. The research project "Special Tuina Manipulations Treating Cervical Spondylosis & Protrusion of Lumbar Inter-Vertebral Disc" has achieved wonderful effectiveness. Meanwhile he has been participating in several National, provincial and Zhejiang Education Bureau research subjects, several assays have been published in well-know Chinese Medicine Journals. In the past 10 years, Dr. Song has trained at least 100 foreign Tuina practitioners, some of them have become popular Tuina doctors in their home countries. Dr. Jiang Zhong is an Associate Chief Physician of Chinese Medicine, committee member of Tuina Branch-Zhejiang Chinese Medicine Academy. Over 20 years of clinical practice, Dr. Jiang has accumulated abundant experience in diagnosing and treating cervical & lumbar spondylosis, headache, spinal joint dislocation by means of bone setting and re-aligns spinal joints. From 2012-2014, as a leader of China Medical Support Team to Africa, Dr. Jiang had serviced in Namibia for two years, have treated hundreds of local residents, also Mr. Sam Nujoma, the ex-president of Namibia, and many other official governors of the country, won high praises from local government and masses. Meantime, Dr. Jiang is one of the main clinical training instructors in Tuina Dept, speaks excellent English, have taught and trained over 200 foreign Tuina practitioners over the past 10 years. 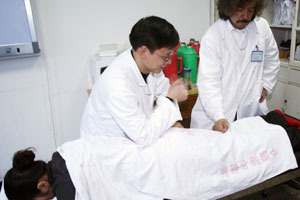 His vivid manipulation demonstration, hand by hand teaching, as well as verbal instruction, helps foreign students learned original and authentic Chinese Tuina technique efficiently. Dr. Chen Wei is an Attending Doctor of Chinese Medicine and Master of Medicine. Her specialty is Pediatric Tuina. It is a special massage for young children branched out from Traditional Chinese Medicine, is a form for external therapy to stimulate specific Acupuncture points or areas for treating and preventing pediatric diseases in children. It works by influencing a child's energetic flow such as Qi in the same way as acupuncture, but use gentle massage to activate the various points instead of needles. Pediatric Tuina is suitable for the treatment of a wide range of common childhood ailments like cold, fever, cough, diarrhea, constipation, indigestion, vomiting, frequent bed-wetting, night crying, stiff neck, short sightedness etc. Pediatric Tuina can also improve child's overall health by strengthening immune system. The child is less lethargic and has a better appetite. In turn, this helps to promote growth in children and boost their brain development. As there is no need to take medication or have injections, children can more easily accept treatment in the form of Pediatric Tuina. After 5 years practice, Dr. Chen has accumulated rich experience in treating child cerebral palsy, mental & physical retardation, torticollis, short sightedness, allergic rhinitis and childhood common diseases, well known in domestic for her skillful technique and obvious effectiveness. Dr. Niu Ming is an Attending Physician of Chinese Medicine, Master of Medicine, graduated from La Sapienza Universita degli studi di Roma medical college, major in Combination of Chinese Medicine with Western Medical. Dr. Niu is specialized in using combination of Tuina manipulation and acupuncture to treat protrusion of lumbar inter-vertebral disc,cervical spondylosis, frozen shoulder, knee osteoarthritis, spinal-related disease, cholecystitis, gastroptosis, dysmenorrheal. It has gained satisfied effectiveness, 6 related papers has been published in domestic and overseas medical journals. Dr. Niu is also good at Pediatric Tuina in treating infantile diarrhea, infantile malnutrition, weak body constitution etc. 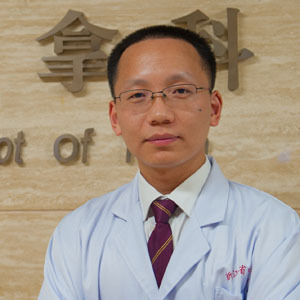 Dr.Pei Jianwei is resident doctor of Tuina department, Master of Medicine, he is especially good at healing osteoarticular diseases, such as protrusion of lumbar intervertebral disc, cervical spondylosis and strain of lumbar muscles in TCM methods (Chinese herbs, acupuncture and tuina). And he is also good at pediatric tuina, using gentle Tuina manipulation to treat common childhood diseases, like digestive system disorders, bronchitis, cough, asthma,etc.